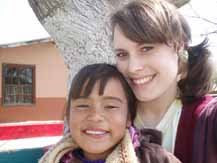 A Grace College student was featured in the local (Warsaw, Indiana) newspaper this week for having spent her spring break ministering at an orphanage in Mexico, and having written a book about the experience. Here is an excerpt from the story on Hope Rauchenstein (pictured with orphan). To read the entire article click here. WINONA LAKE – While many students spent their spring break partying, Grace College freshman Hope Rauchenstein used her passion for children and spent her spring break volunteering at an orphanage in Mexico. Rauchenstein, 19, an elementary education major, spent her spring break volunteering at Door of Faith Orphanage in La Mision, Mexico, a town south of San Diego, Calif.